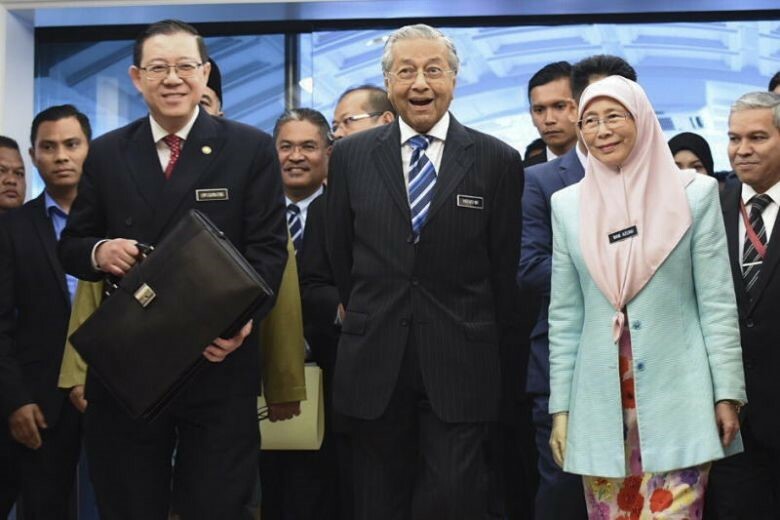 KUALA LUMPUR – The first Budget of the new Malaysian government will unveil a soaring deficit of 3.7 per cent of GDP for this year, as the administration recognises off-the-books projects as development expenditure and moves to repay RM37 billion (S$12.2 billion) in tax refunds owed by the former administration. Finance Minister Lim Guan Eng’s historic Budget 2019 will see national oil giant Petronas cough up RM30 billion in a “special dividend” to help ease the blow, while cuts to subsidies and cash handouts are also set to be rolled out in what Prime Minister Mahathir Mohamad had warned would be a “budget of sacrifice”. Malaysia’s deficit stood at 3 per cent of gross domestic product in 2017, and was originally forecast by the previous government to fall to 2.8 per cent this year. The Budget also estimates economic growth will slow to 4.8 per cent this year, from 5.9 per cent last year, and hit 4.9 per cent in 2019. Mr Lim began presenting the Budget in Parliament at 4pm on Friday (Nov 2), but had said in the Finance Ministry’s Fiscal Outlook 2019 report that the government faces “fiscal challenges… arising from previous abuses of power”. “The recognition of several off-budget liabilities as part of the government’s direct obligations and… debt servicing for government-linked companies (GLC) such as 1Malaysia Development Berhad” were cited as moves to increase transparency and accountability in government finances. Although Kuala Lumpur is spending RM290.4 billion this year – RM10.1 billion more than earlier projected – most of the increase is for development expenditure. These include financing for the Light Rail Transit 3, housing and double tracking of the national rail line. Certain grants to statutory bodies and GLCs executing development projects have also been transferred from the operating budget. Expenditure is expected to soar to RM314.6 billion in 2019, an increase of 10.7 per cent from 2018. This will include the one-off payment of RM37 billion owed in tax refunds. The Finance Ministry, however, expects to reduce operating expenses by RM12.6 billion next year. About RM6 billion in savings will come from targeting fuel subsidies at poorer Malaysians, and narrowing the Cost of Living Aid (BSH, formerly known as BR1M) cash handout to 4.1 million recipients from seven million previously. Revenue for 2018 is expected to come in at RM236.5 billion, after the government did away with the 6 per cent goods and services tax in June. Meanwhile, the Treasury will bring in RM261.8 billion in 2019, thanks to the RM30 billion dividend from Petronas.